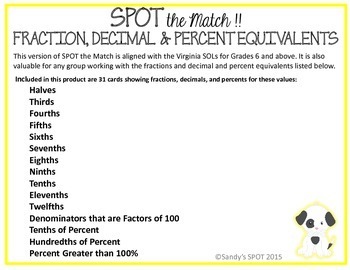 If you are working on identifying FRACTION DECIMAL AND PERCENT EQUIVALENTS , this Spot the Match activity is a great resource. This is a great back-to-school review for grade 7 and also a great review for Grade 6. 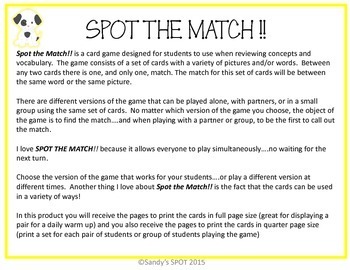 SPOT the Match is a game that includes a set of cards where students look to find a match. Any two cards will have one, and only one, match. These cards are great for partner games as well as for individual student center activities. 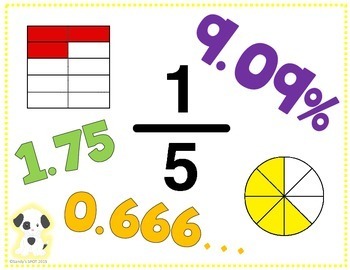 Included in this product is a student recording sheet for use as an individual activity and directions for 3 different versions of the partner games you may play with the cards. 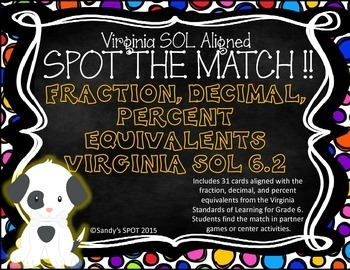 Be sure to check out the other items in my TpT store...task cards, bingo games, sorting activities, matching activities, unit plans, everything you need to prepare your students for VA SOL Math testing. (c) 2015 – Sandy’s SPOT. Permission is granted to original purchasers to reproduce material as designated only for their own classroom use. No other part of this work may be reproduced in any form or by any electronic or mechanical means including information storage and retrieval systems without permission in writing from the publisher.